Various types of mice and rats can be found in homes, often entering in search of food or shelter. 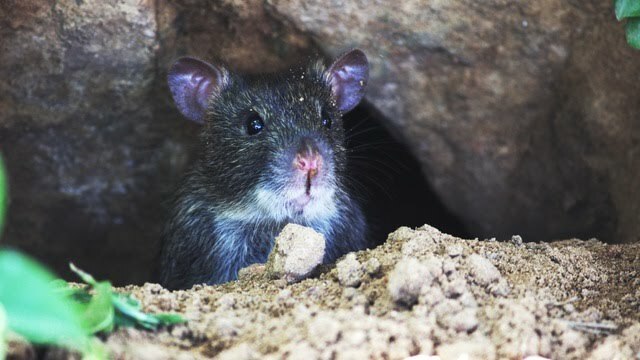 While the type of mouse or rat is typically not important to know, rats and mice do have different behaviors that homeowners can look for when determining if a rodent is present. 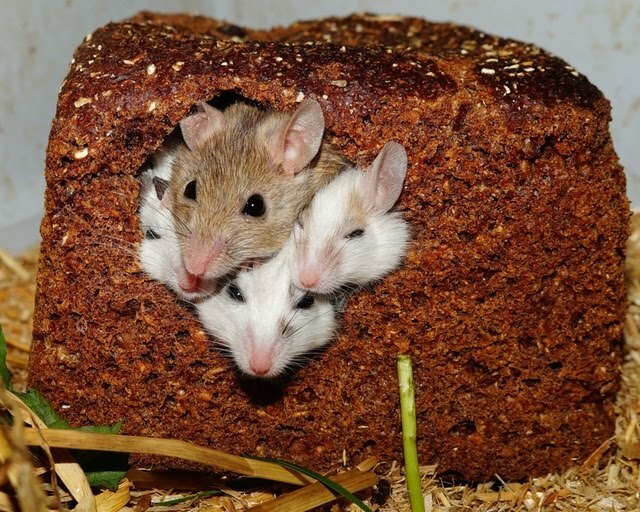 House mice have an especially cloying acetamide smell that other mice do not. Both rodents often leave gnaw marks on many surfaces since they need to continually chew to keep teeth short. Rat tooth marks can be recognized by their large size. Rats can also chew through soft metals such as lead or aluminum that a mouse would not be able to penetrate. Rat droppings are typically around 12mm long and tapered at one end while mice droppings are half the size and thinner. Rats and house mice tend to leave greasy fur marks, typically appearing as black smears, along routes where they often travel or enter the house. While most problems caused by rodents are most often nothing to be concerned about, homeowners might experience minor damage to furniture, internal structures, food stores, insulation, and wiring. Wire damage could pose a bigger threat as it could potentially start fires and be expensive to repair. When attempting to rid the home of rats or mice, there are varying methods that can prove efficient. Peppermint oil: Similar to a method used for ants, simply drop some peppermint oil onto cotton balls and place where the mice are residing. The oil will dissipate quickly, so the balls should be replaced up to a couple times a week to be effective. Mothballs: Take the mothballs directly from the box and place near areas inhabited by rodents. Be sure to keep them away from pets or children, as consumption or misuse can lead to serious complications. Fresh Cab Natural Rodent Repellent: Online reviews claim this pleasant smelling mix of corn cob chips, herbal extracts, and plants serves to deter rodents. The mix comes in various pouches, which are to be placed where mice or rats are residing or enter into the home. The animals will seek shelter somewhere where the smell does not exist, and vacate your home. Some consumers note that this method is most effective when there is little airflow in the room, such as those with closed windows or air conditioning turned off. This particular product is registered with the EPA. Snap Traps: Often what people imagine as the classic mouse trap, snap traps are a humane way to kill the rodent should that be the path you choose. The animal dies instantly when the device snaps its neck. Live Traps: While this may sound more humane, often putting a house rodent in the wild will result in its death. In addition, if the animal isn’t released at least 1.25 miles from the house, it will likely return and get back into the house even before you do! Poisons: Certainly effective, but the animal will die a slow and painful death. This is the least humane option for ridding the home of rodents. Also, if the mouse or rat gets eaten by a predator such as a barn owl, stoat, or weasel before dying, it can be harmful to the other animal involved. If the process becomes overwhelming or you’re unable to get the mice or rats out of your home, you can certainly call a pest control specialist and they will be able to eliminate the problem. Typically entering the home in search of food or warm shelter, snakes can get in through various methods. Usually they enter at ground level, snakes can fit through even the smallest holes, so it’s important to not overlook anything if attempting to snake-proof your home. Inspect the foundation for unsealed wire pipe conduits, basement doors or windows that are not sealed tightly, or even holes in the ground near the foundation itself; if a snake’s head could fit through, then it serves as a viable access point. Some snakes have the ability to climb, using trees, shrubs, stone walls, or even chimneys to gain access to the roof, so checking eaves and the roof itself can prove important. Be sure to also include porches, steps, and where decks attach to the house in your inspection. Snakes are attracted to piles of rock, wood, and debris, tall grass, undergrowth, cracks around concrete porches and sidewalks, storage sheds with space under the floor, and pet foods or household garbage left outside. Noting these items and removing them or fixing problems may deter snakes so that they don’t ever become a problem. Since snakes eat mice, you may have a mouse problem as well if you discover a snake in your home. Of course, sometimes snakes can enter the home completely by accident and become trapped, so often they want to get out as badly as the homeowner wants them out! Most snakes in Massachusetts are harmless, but there are two types of venomous snakes that reside in the state: the timber rattlesnake and the copperhead. While bites should be avoided regardless of the species, identification of the animal can determine what action needs to be taken should one occur. 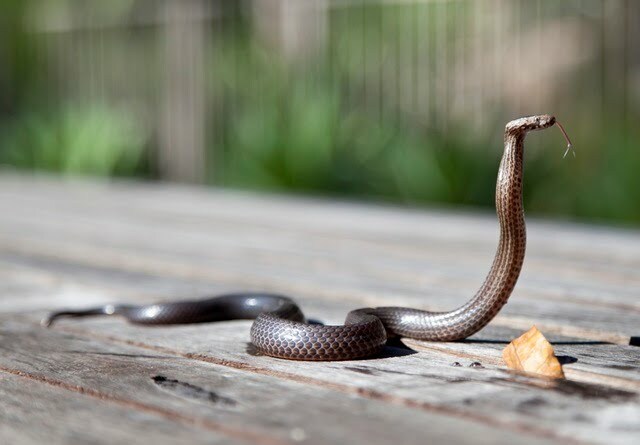 More often than not, the snakes homeowners come into contact with should not be regarded as dangerous. In any case, you should still seek to remove them from the home as soon as possible. In most cases, an experienced handler should be contacted to remove the snake, but there are some things you can do before they arrive. Remain calm and quiet when near the snake as disturbing the animal might send it into hiding, making it more difficult to find and remove. If possible, open a nearby door and try to herd the snake outside with a broom or mop. If the snake is small or coiled, place a wastebasket over it and weigh down the container. If you cannot trap the snake, try to confine it with boxes or barriers so it is unable to hide. Snakes are drawn to warmth and darkness, so if the snake has gone into hiding, try placing a heating pad or pile of burlap on the floor to attract the animal. If you find that you’re not afraid of snakes and feel comfortable handling the animal without hurting it or yourself (of course with certainty that the animal is not venomous), you can wear thick gloves to pick up the snake and relocate it to the outdoors a distance from the home. Squirrels are different from many of the other animals discussed because they very infrequently enter the home on purpose. While other vermin may be in search of food or shelter, squirrels more often than not come into the house fearful and trapped. Since the animal can often panic, it won’t take long to notice if there is a squirrel in the house. Close all interior doors and open a window or exterior door for the squirrel to exit. Be sure any pets or children are removed from the room prior to closing it off. If the squirrel is unable to exit, put on heavy gloves and very slowly approach the animal with a blanket in front of you so it is unable to see that you’re a human. Drop the blanket on the squirrel and quickly roll it up; be sure not to hurt the squirrel by putting too much pressure or weight on top of him. Immediately bring the animal outside and gently open the blanket on the ground so they can escape. Humane traps can also work by using a small amount of peanut butter and leaving the trap out for the squirrel to find. Relocating the animal to a different area could be harmful to the squirrel, so avoid trapping them and letting them go elsewhere. They will not try to get back into the home unless they have a nest or babies inside. If there are squirrel babies inside, it may be best to let the animals continue to reside there until they are grown enough to move around. If you seal entry points too early, the mother may be trapped outside and the babies could die. 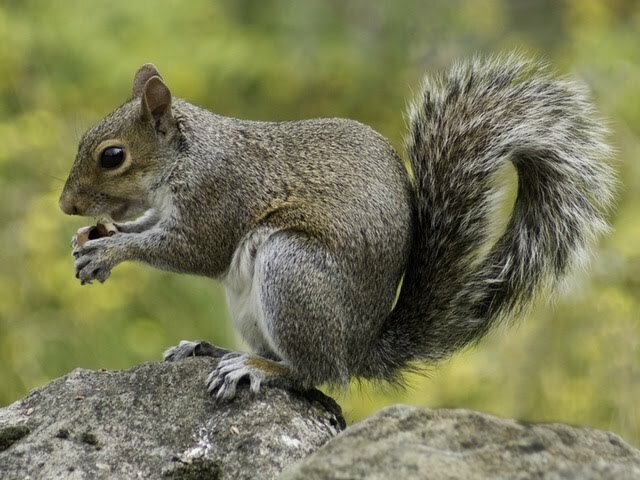 If you are unable to remove the squirrel by yourself or there is more than one animal, it may be best to call a professional experienced with squirrel removal. Once the animals are no longer in the home, determine how the entered in the first place to prevent it from happening again. Seal any obvious entry points; foundation, attic, etc. Cover chimneys with chimney caps, and keeps doors closed when not in use. Seemingly adorable, raccoons can move into spaces like the roof or attic to find shelter or have babies. Before you’re able to remove the vermin from your home, you’ll want to find how they’re entering in the first place. If you find an opening and you suspect that is how the raccoon is entering, block it up with loosely wadded newspaper. Leave in place for two - three days; if undisturbed, it is likely not being used. If disturbed or pushed out of place, the raccoon is using that opening to enter. Similar to with squirrels, any babies need to be old enough to leave with their mother. Raccoon babies cannot crawl, so their mothers must carry them before they are old enough to move around individually. Do not try to trap or relocate the family yourself; this more often than not leads to separation from the litter and mother. Allow a professional to move all the animals so that the mother can find a new den herself and not lose any babies along the way. If you’re sure there are only adult raccoons in the home, harassment can be a useful tool. Bright lights, loud noises or music, and unpleasant smells such as cider vinegar can help drive the raccoons out of residence. Doing all at the same time is most effective. Driving out the raccoons is best done at dusk, right before their normal activity period; it should not be done during the day. Once they have vacated the premises, cover or otherwise eliminate access holes where the raccoons were able to enter the home. Of course, this should only be done once the animals have safely evacuated. 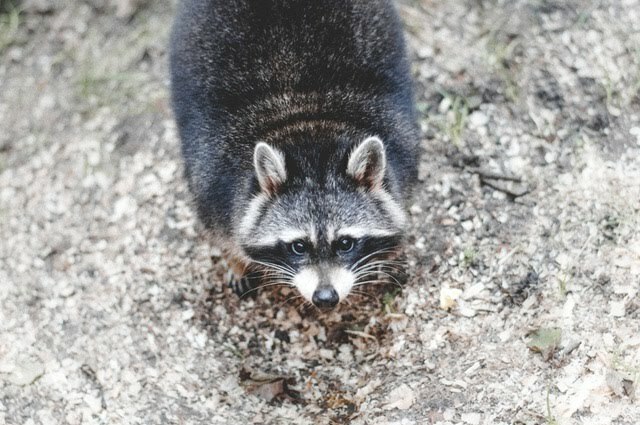 Feces may have accumulated from the raccoons setting up house; it is important to avoid exposure to roundworm eggs, which can be found in raccoon feces. Ideally, have a professional come and clean out the area. If you attempt to tackle the project yourself, it is important to follow the CDC’s guidelines for optimal protection. The Humane Society of the United States. (October 2, 2009). What to Do About Snakes. Retrieved from http://goo.gl/1UNaK5. UMass Amherst. Snakes of Massachusetts. Retrieved from http://goo.gl/e0Kgeb. Harris, Steve. (June 22, 2012). How to Deal with Rats and Mice in Your House. Retrieved from http://goo.gl/I9Beju. EarthKind. Proven Best Ways for Getting Rid of Mice Naturally. Retrieved from http://goo.gl/uKle97. Lupo, Lisa Jo. Squirrels in Your House and How to Get Them Out. Retrieved from http://goo.gl/s0QOmY. The Humane Society of the United States. (August 23, 2012). There’s a Squirrel Loose in the House. Retrieved from http://goo.gl/7peD5e. The Humane Society of the United States. (March 13, 2012). Getting Raccoons Out (and Keeping Them Out). Retrieved from http://goo.gl/Rao4TK.